New Delhi: About 22% of business correspondents (BCs) in India, responsible for providing banking services in unbanked areas, faced fraud in 2017, a significant increase from only 2% two years ago, according to a survey by financial inclusion consultancy MicroSave. In its report titled State of the Agent Network, India 2017, released on Wednesday, MicroSave said the incidence of fraud is higher (29%) among high-performing agents compared to others (18%). “This is probably because they conduct more transactions," it said. High-performing agents are those who conduct a median of 40 or more transactions a day. 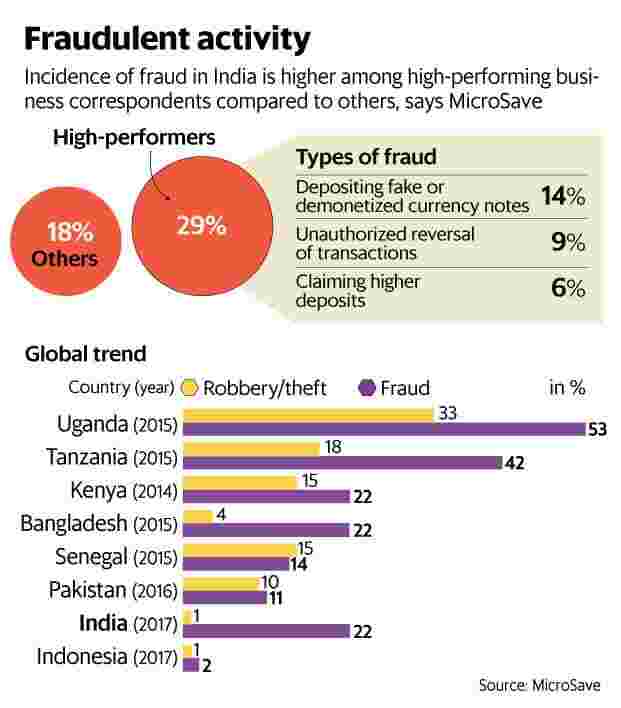 Of the various types of fraud reported, the most common ones relate to fake or demonetized currency notes (14%). These are followed closely by unauthorised reversal of transactions (9%) and customers getting more money deposited than the actual amount given to agents during transactions (6%). Among the agents who experienced any kind of fraud, 42% did not report them to anyone while 32% reported them to the provider and 30% to their higher authorities. Releasing the report, Lok Ranjan, joint secretary at the department of financial services, said so far the department’s focus was more on protecting customers from fraud and unethical practices. “What has been mentioned today is the BCs themselves being subjected to frauds. We will engage with them to see how we can make the system as fraud-proof as possible," he said. “This is a crucial to the survival of the system, not only in terms of the monetary losses that it will incur but also in terms of credibility. Once credibility goes, it will be very difficult to connect with the large numbers we are targeting under the National Mission for Financial Inclusion," Ranjan added. The business correspondent model initiated in India in 2006 by the Reserve Bank of India (RBI) allowed banks to employ intermediaries to expand reach and promote financial inclusion using agents. In 2010, RBI widened the list of eligible entities, which included for-profit companies, that could appoint business correspondents. In 2015, RBI issued in-principle licences for new banking models such as payments banks and small finance banks, resulting in new players entering the banking sector, thus further expanding the business correspondent network. While new players have emerged, public sector banks still lead the pack. In 2015, the State Bank of India (SBI) dominated the market with a one-third share of agents. The bank’s presence increased to 38% in 2017 with a greater presence in non-metro urban areas. The market presence of other public sector banks and private sector banks have decreased from 43% in 2015 to 35% in 2017 and 21% in 2015 to 14% in 2017, respectively. “This can mostly be attributed to emerging new players like payments banks and SBI’s growing network," the report said. Payments banks have a better presence in metro areas (15%) than rural (2%) and non-metro areas (9%).